The next generation of recliners has arrived in fine style. 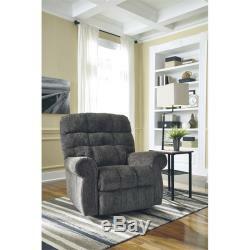 Beyond its perfectly placed pillow support and sumptuous chenille-feel upholstery, Ernestine power lift recliner with dual motor design takes custom comfort to a new level. With the touch of a button, power lift feature gently eases you from the ultimate slumber into a lift-and-tilt position to get you back on your feet, effortlessly. Frame constructions have been rigorously tested to simulate the home and transportation environments for improved durability. Corners are glued, blocked and stapled. Stripes and patterns are match cut. All fabrics are pre-approved for wearability and durability against AHFA standards. Cushion cores are constructed of low melt fiber wrapped over high quality foam. Features metal drop-in unitized seat box for strength and durability. All metal construction to the floor for strength and durability. 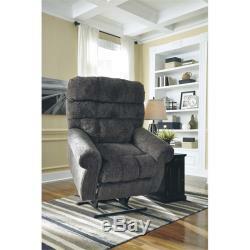 The power reclining mechanism features infinite positions for comfort and a lift feature for ease of exiting the chair. Cleaning Code for the Body: W - Water. 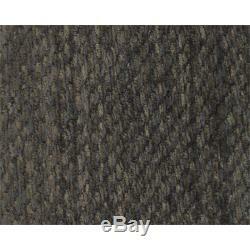 Overall Product Dimensions: 43" H x 38.75" W x 37 D. Overall Product Weight: 145 lbs. Distance Between Arms: 22.75. Reclined Footrest to Floor: 20.00. 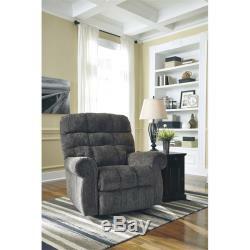 Fully Reclined Length: 138.75" x 71.50" x 29.00. Distance Between Recliner and Wall: 15.00. Distance from floor to Top of arm: 26.00. The item "Ashley Ernestine Power Lift Recliner in Slate" is in sale since Thursday, August 24, 2017. This item is in the category "Home & Garden\Furniture\Chairs".